Dr Andrew Knox is the only Podiatric Surgeon in Western Australia who performs an advanced surgical treatment for brachymetatarsia (congenitally short metatarsal bone) through the use of an external fixator. 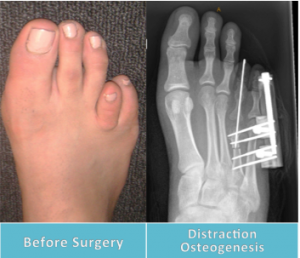 The procedure, called distraction osteogensis, allows for a controlled lengthening of a short metatarsal bone over the period of two months through small daily adjustments of the fixator device. The procedure can also be performed as a revisional procedure for failed bunion correction, and avoid the need for surgical fusion of the joint. The surgery may provide patients with a better overall cosmetic appearance of their foot, and can help to restore stability to the forefoot. This website is intended for general information purposes only. Any surgical or invasive procedure carries risks. Before proceeding, you should seek a second opinion from an appropriately qualified health practitioner. For more information, we recommend making an appointment to see our specialist podiatric surgeon Dr. Andrew Knox prior to making decisions about your health care.